What is The Secret Mirror 3.0? Mirrors show us our reflection and reveal our outer appearance – what our hair, skin, eyes and bodies look like. They can allow us to check for broccoli in our teeth, look at our outfits and admire a new haircut. What they can’t show us is something far more complex – our minds. But what if there was a product out there that could? Something that could allow us to reach inside and see the workings of our minds. A program that could teach us to communicate and manifest positive thinking? Something like… The Secret Mirror? 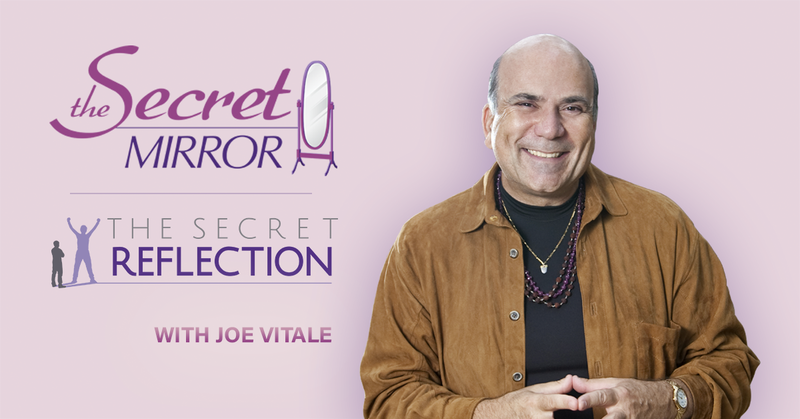 The Secret Mirror 3.0 is an online membership course created by Joe Vitale. Vitale, often called the ‘Buddha of the internet,’ is known for his charisma and unique communication style. He is the president of Hypnotic Marketing Inc and an expert on the Law of Attraction. Vitale draws much of his manifestation teachings on his experiences and past. At the lowest point of his life he was broke, desperate and living on the street. Vitale notes that through a series of ‘coincidences’ he found his calling and has since found success both personally and professionally. “Bring me your passion and conviction, and I’ll show you how, using The Secret Mirror, you can attract abundance into your life, with the long misunderstood and missing scientific ‘formula’ behind the Law of Attraction. As he mentions, The Secret Mirror is based around the Law of Attraction – a belief in the ability to attract and will our wants into reality. In short, it uses the power of the mind to translate whatever is in our thoughts and materialize them into reality. At this point you might be thinking – “this sounds crazy,” and, well… it does. How can simply thinking about something will it into existence? First, it’s important to know that the Law of Attraction isn’t a magical concept that requires potions or spells to work. It is a belief that is backed by years of scientific research and study. In addition, it is a concept that has been around for a very, very long time – in fact, you could even trace it back to the beginnings of Hinduism or Christianity. Meaning that you receive what you pour out into the world. So positive thinking (ie: the Law of Attraction) can allow you to receive positivity back – through your dreams, wants and aspirations. So while the concept of the Law of Attraction isn’t specially mentioned, we can clearly recognize its core beliefs have been around for quite some time. So when does the concept begin? In this Troward is expressly commenting on the power of attraction and how it can influence manifestation. He notes that positive thinking can, in fact, influence and will physical items and goals into being. For example, if you want a job promotion the Law of Attraction states that your mind can make it happen. Not through magic or outside influence – but through a positive, clear and open headspace. Because when we allow our minds to block out distractions and focus on a specific goal we are gaining a tool (manifestation) that will help us to progress our goals. It’s not about being handed the job promotion – it’s about manifesting it into happening by believing it will and doing whatever work it takes to achieve. This is exactly what Joe Vitale wants to help you with in The Secret Mirror. It is a program that will teach you how to unlock your true manifestation potential. The Secret Mirror 3.0 program is delivered via Greater Minds membership platform. Simply log in – and all the videos, audios and other items are there for you, ready when you are. You learn how by watching Joe using the process himself on video. You then see it being used with 4 hand-picked students so that you can watch and understand the full process on video. The program is intuitive and simple in nature but contains information and tools that can be used again and again. The Secret Mirror™ 3.0 System – Watch Joe Vitale demonstrate The Secret Mirror in easy to follow steps for you on video. This is the exact system that Joe practices every single day. You will also sit in on his own personal mirror sessions to gain more clarity. The Secret Mirror separates itself from similar programs through its visual representations and modules. Manifestation, the Law of Attraction and, thereby, The Secret Mirror is meant for anyone wishing to better their lives and communicate more clearly with their minds. The Secret Mirror is Ideal for any age, gender, culture or otherwise. And, despite many thoughts to contrary, most people manifestation can work for most people – if you allow it too. There is a certain degree of believability required for programs such as The Secret Mirror. Therefore if you sow negativity, you will also reap it. If you believe manifestation won’t work – it won’t. Approaching The Secret Mirror with skepticism or negative thinking will not allow you to see successful results. Therefore, try to go into the program with an open mind. Believe that the program will work for you and change your life. As mentioned above, The Secret Mirror – and similar Law of Attraction products – will work if you let them. But beyond that, there is still some skepticism about the effects of the Law of Attraction. After all, it’s hard to wrap your mind around the fact that simply thinking positively will allow the universe to reward you positively. But the Law of Attraction is not without its research. It’s validity has been published in many medical journals, including The Yonsei Medical Journal. In the journal researchers found that there was a strong connection between positive thinking and overall life satisfaction in the population. Another prime example comes from the scientists working at the Wellcome Trust Center for Neuroimaging in London who discovered that people who visualize a better future are more likely to be able to bring that future into existence. These findings back the core of what the Law of Attraction states – that good things can be manifested into reality. Follows real people. It’s one thing for a program to offer resources and support – but what about one that allows you to follow the real life journey of people completing the same program? You’ll have first hand insight into how The Secret Mirror changed and influenced 4 people personally coached by Joe himself. Based on the Law of Attraction. The Law of Attraction has a deep and studied history. It’s been scientifically studied by numerous experts over the years, making it the ideal basis for a concept such as The Secret Mirror. The concept of the Law of Attraction is woven throughout the design of The Secret Mirror, allowing users to practice manifestation to its highest degree. It’s not ‘magic’ – You have to be willing to act on the results of your manifestation. The Law of Attraction won’t make a new car suddenly fall into your hands. You have to be willing to work for the dreams that you manifest. Manifestation can help you visualize success and make it easier to achieve. The entire Secret Mirror program can be purchased for $49.00. Money-Back Guarantee – The Secret Mirror offers a 60 day money-back guarantee if you are unsatisfied with the results of the program. It’s easy to see why The Secret Mirror is one of the most popular of its kind on the market. The unique coaching style paired with the visual experience of seeing the program utilized by Joe himself. Not to mention the history and research backing the concept of the Law of Attraction. If you’re still unsure about The Secret Mirror – or the Law of Attraction in general – rest easy that your purchase comes risk-free. The money-back guarantee is perfect for those who want to try out the program but are worried it might not work for them. And remember: You get what you manifest, so manifest a positive experience with this product!